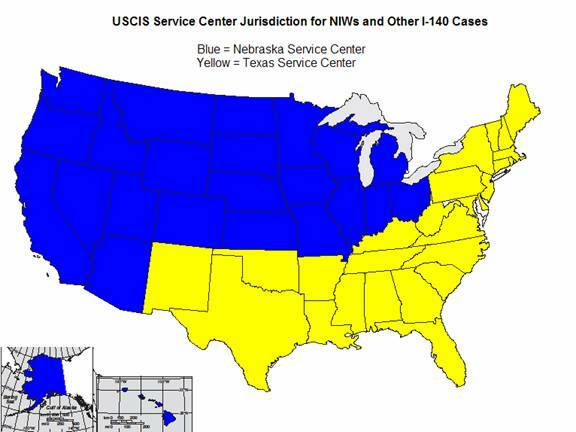 Recently, we have noticed that some NIW cases are being transferred from the Texas Service Center (TSC) to the Nebraska Service Center (NSC). All of the beneficiaries of these petitions lived within the TSC’s jurisdiction when they filed their petitions, but their cases are being transferred nonetheless. Again, in all of these cases, the beneficiary lived within the TSC’s jurisdiction when the petition was filed. Furthermore, not all NIW cases filed to the TSC are being transferred; it seems to be happening according to the discretion of each individual USCIS officer. USCIS is able to transfer these cases relatively easily because they use the Oracle customer relationship management (CRM) system, just like our firm does. Oracle CRM tracks a case online and makes it accessible from any USCIS service center. Thus, it is possible that having an NIW case transferred from the TSC to the NSC will result in delays. There has been no formal announcement about this matter from USCIS. We imagine that USCIS considers these transfers to be internal workload reallocation, so we cannot dispute them right now. Since USCIS officers are supposed to use the same standards when they process petitions, we don’t think this transfer will influence the results of the cases being transferred. However, we will do our best to continue to advocate for our clients’ best interests, including the fastest possible case turnaround, and perform close follow-up on the cases being transferred.